As you probably remember from my first blog last year, Lifestyle Medicine emphasizes the use of lifestyle changes and interventions to prevent, treat, and manage disease. It does not matter what stage you are in life, these changes can prevent many of the chronic diseases or make you healthier as you continue to live with them. We have talked about diet and exercise and we all agree how important it is to eat healthy and to at least walk for 30 minutes 5 days a week. We will revisit those recommendations in more detail later this year. Now, I would like to share with you what I have learned that expands the concept of health and well-being. The US Department of Agriculture (USDA) recently replaced the food pyramid with a “choose my plate” pictorial example of a dish of food groups that remind us of what a daily diet should consist of to optimize physical health. Well, Dr. Dan Siegel and his colleague David Rock developed what they called “The Healthy Mind Platter”. It includes seven daily essential mental activities that optimize brain matter and create well-being. It is the equivalent of the daily nutritional recommendation but for a healthy mind. 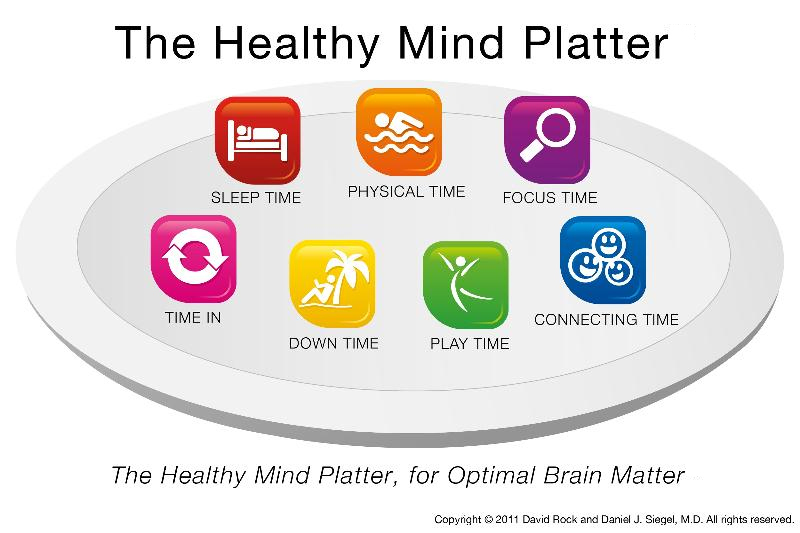 You can see a picture of The Healthy Mind Platter below with Dr. Siegel’s explanation. These seven activities represent the “mental nutrients” that you should do every day so your brain and relationships function at their best. As Dr. Siegel says, how much time you devote to each one is up to you as we are all different and our needs change over time. It is not surprising then that these activities also promote neuroplasticity. You may remember neuroplasticity and neurogenesis from my blog last May. Neuroplasticity is the ability of the brain to change its structure in response to experience. This means that the brains grows new connections among existing neurons or nerve cells, as well as forms brand new nerve cells. Of course, as Dr. Siegel says, “there is an upside and a downside. The challenge is that negative experiences can alter brain structure in long-lasting ways that make life difficult. The positive opportunity that neuroplasticity affords is that it is never too late to use the focus of attention to alter the brain’s architecture.” And that is where “The Healthy Mind Platter comes in. You can alter your brain’s physical characteristics and function as you follow this healthy “mind diet”. One of Dr. Siegel’s missions has been to define the mind – “an emergent process that is both embodied and relational that regulates the flow of energy and information.” This is a mouthful but we will spend some time in the future dissecting the definition and making it easier to understand. In the meantime, it is important to note that the mind cannot exist without relationships. In that sense, the mind is not the activity of the brain. For the mind to be healthy, you need a healthy brain and healthy relationships. Please look at the plate below and read the simple description of each one of the activities. These activities will nourish your whole body and your mind, as it helps you achieve health and well-being.